The second Pollack (SSN-603) was laid down by the New York Shipbuilding Corp., Camden, N.J., 14 March 1960; launched 17 March 1962; sponsored by Mrs. John O. Pastore; and commissioned 26 May 1964, Comdr. Harvey E. Lyon in command. Pollack reported to Commander in Chief, U.S. Atlantic Fleet for duty, and became a unit of Submarine Squadron 4, homeported in Charleston, S.C. After shakedown in the Caribbean, she underwent a six-month evaluation as an antisubmarine warfare weapon. Most of 1965 was spent at sea evaluating new ASW tactics, participating in a destroyer versus submarine evaluation, and practicing an anti-shipping mission. 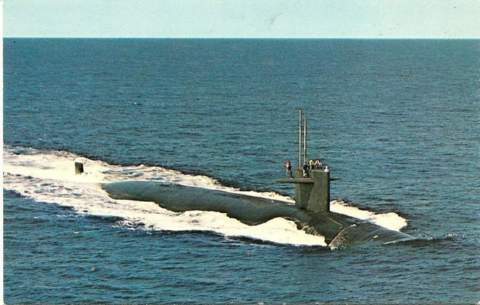 During 1966 Pollack was evaluated in coordinated ASW operations. She spent most of 1967 at sea, making various weapons tests. On 1 March 1968, Pollack's homeport was changed to Norfolk and she became a unit of Submarine Squadron 10, the first all nuclear attack submarine squadron in the Navy. Pollack remains with the Atlantic Fleet into 1970.